Countless studies have shown that a comprehensive workplace wellness and fitness program strengthens an organization by strengthening its members. As a result of these findings, many forward thinking organizations have discovered the benefits of making private fitness centers available to their members. Corporations, universities, country clubs and residential communities are using private fitness centers to gain a competitive edge in their marketplace. So how does an organization without fitness expertise leverage this benefit? That's where we come in. Your employees get fit while we do the heavy lifting. More than three decades of experience, running more than 60 private fitness centers, has made us the recognized leader in the delivery of corporate fitness and wellness services. We take care of all aspects of running your fitness center including management, staffing, design, equipment purchase, fitness programming and marketing to your employees. When you partner with the Private Fitness Center Management team you receive a wide range of unparalleled benefits. Let's take a closer look. Locations where you live and where you work. In addition to your private center, your employees and their families will have access to the more than 160 New York, Boston, Washington and Philadelphia Sports Clubs. Now that's convenience! We'll build a fitness center that's the right fit. We'll conduct a thorough review of the proposed center's location and its capacity to serve your current employee population. Next, we'll build employee participation scenarios based on the data to help you determine your private center's feasibility and return on investment. Our many years of experience have given us valuable knowledge and insight relating to fitness center design. Working with your architects, we'll design an efficient, workout-friendly layout that maximizes your available space. Combine this with intelligent equipment placement and you end up with a fitness center that can comfortably accommodate peak-hour member usage. We offer a full array of wellness programs and events designed to educate employees about the value of choosing a healthy lifestyle. We'll provide the tools and guidance for them to achieve and maintain optimal health. 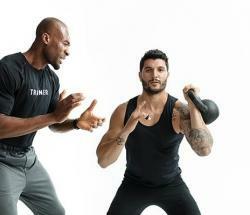 Every fitness center member "starts smart" by partnering with a certified personal trainer. Using a health history questionnaire, the trainer conducts a health assessment to better understand the member's past medical history, risk factors and exercise habits. Next they'll build a customized workout routine that supports their goals and maximizes their gym time.